This latest installment in the Retrieval Artist Series by Kristine Kathryn Rusch focuses on different characters outside of the main protagonists, Retrieval Artist Miles Flint and the Moon’s Chief Security Officer, Noelle DeRicci. 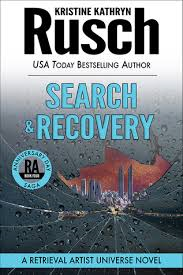 In her author’s note, Rusch writes that Search & Recovery is actually written out of order. The events of this novel takes place after Anniversary Day, the first book in the Anniversary Day Saga but was published as the fourth book in the saga. She goes on to explain why the rest of the books in the series after Blowback, the second book in the Anniversary Day Saga, were released in a TV episode style similar to what you see on Netflix or Amazon. I can respect an author’s creativity and whatever it takes writing or publishing wise to make this series works has truly been an enjoyable reading experience for me. I would recommend to start with Anniversary Day and read this saga as it currently published and you will be able to connect all various threads together. Luc Deshin, the master criminal from the Moon’s colony Armstrong, is the main character in Search and Recovery. The Anniversary Day bombings on the moon hit to close to home and he has decided to use his influence, wealth, and skill to find out what really happened on the fateful day of those bombings. What he discovers and gets immersed into will reveal a lot more than he bargained for. The story reveals a couple of new characters, Berhane Magalhares and Donal O’Bradaligh, that adds more intrigue into helping solve the mystery of who committed those Anniversary Day Bombings. One of Rusch’s strengths as a storyteller is writing fully fleshed and multi-dimensional characters throughout this series. Even though, Search and Recovery will seem like a filler novel in order to tie loose ends together, I’ve learned about more characters outside of Flint and DeRicci that will have a signficant role in finding out about the bombings. Search and Recovery is another solid entry in the Retrieval Artist Series. It is recommended reading in order to get one step closer in finding out who is responsible for those Anniversary Day bombings.